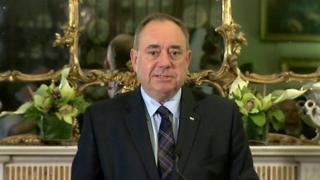 Image caption Leigidh Ailig Salmond dheth a dhreuchd mar cheannard Pàrtaidh Nàiseanta na h-Alba, an SNP, an dèidh dà theirm a mhair 20 bliadhna uile gu lèir. Tha Ailig Salmond a' dol a dh'fhàgail a dhreuchd mar Phrìomh Mhinistear na h-Alba an dèidh do luchd-bhòtaidh na h-Alba neo-eisimeileachd a dhiùltadh. Leigidh Mgr Salmond cuideachd dheth a dhreuchd mar cheannard Pàrtaidh Nàiseanta na h-Alba, an SNP, an dèidh dà theirm, a mhair le chèile 20 bliadhna. Bhòt 2,001,926 de luchd-bhòtaidh na h-Alba airson fuireach san Rìoghachd Aonaichte ann an referendum Dhiardaoin, le 1,617,989 a' bhòtadh airson neo-eisimeileachd. Aig a' cheart àm, tha a' Bhànrigh air a ràdh gu bheil bhòt na h-Alba airson fuireach san Aonadh na "thoradh dhan toir a h-uile duine air feadh na Rìoghachd Aonaichte spèis". Thuirt am Prìomhaire, Daibhidh Camshron, gun leanadh na trì prìomh phàrtaidhean aig Westminster le an gealltanas gus cumhachdan a bharrachd a thoirt do Phàrlamaid na h-Alba. 'S e Ailig Salmond, aois 59, as fhaide a bha na phrìomh mhinistear an Alba riamh, 's e air a bhith san dreuchd on a choisinn an SNP cumhachd anns a' Phàrlamaid Albannaich sa Chèistean 2007. A' bruidhinn bho a thaigh-còmhnaidh oifigeil, Taigh Bhòid ann an Dùn Èideann, thuirt am Prìomh Mhinistear: "Dhomhsa mar cheannard, tha m' ùine gus a bhith seachad, ach airson Alba, tha an iomairt a' leantainn agus mairidh am bruadar gu bràth. "Tha mi air leth pròiseil às an iomairt a rinn Bu Chòir Alba agus gu sònraichte às an 1.6 millean luchd-bhòtaidh a bhrosnaich a' chùis." Thuirt Mgr Salmond gun leigeadh e dheth a dhreuchd mar cheannard an SNP aig co-labhairt a' phàrtaidh san t-Samhain, sin mus fàgadh e a dhreuchd mar Phrìomh Mhinistear nuair a thaghas am pàrtaidh an ath cheannard ann am baileat bhallrachd. Thuirt e gun robh "grunn thagraichean air leth freagarrach agus teisteanaichte" ann a dheadh na àite. Ach tha coltas gur h-i Nicola Sturgeon, a tha an-dràsta na Leas-Phrìomh Mhinistear, an tagraiche as roghnaiche. Thuirt Mgr Salmond, a leanas mar BhPA airson Siorrachd Obar Dheathain an Ear: "Tha e air a bhith mar phibhleid mo bheatha Alba a fhrithealadh mar Phrìomh Mhinistear. "Ach, mar a thuirt mi gu tric thairis air iomairt an referendum, chan ann mu mo dheidhinn-sa no mun SNP a tha seo. Tha e tòrr mòr nas cudromaiche na sin. "'S ann mar seo a tha cùisean. Chaill sinn bhòt an referendum ach 's urrainn dhuinn leantainn oirnn le ar n-iomairt phoileataigich. Nas cudromaiche buileach, is urrainn do dh'Alba fhathast nochdadh mar an fhìor bhuadhaiche." Thuirt Nicola Sturgeon "nach smaoinicheadh i air pribhleid nas motha na iarrtas a chur air adhart airson a bhith na ceannard air a' phàrtaidh san deach i an sàs agus i dìreach 16 bliadhna de dh'aois". Image caption Tha coltas gur h-i Nicola Sturgeon, a tha an-dràsta na Leas-Prìomh Mhinistear, an tagraiche as roghnaiche dreuchd Mgr Salmond a ghabhail. Thuirt i: "Tha na chaidh a choileanadh le Ailig Salmond mar cheannard an SNP agus mar Phrìomh Mhinistear na h-Alba gun samhail. Stiùir e an SNP dhan riaghaltas agus tha e air fèin-mhisneachd às ùr a thoirt dhan dùthaich." Chleachd Mgr Salmond cuideachd a bhrath mu bhith a' leigeil seachad a dhreuchd airson ceist fhaighneachd mu ghealltanas Mhgr Camshron a thaobh tuilleadh chumhachdan. "Tha cothrom againn a-nis cuideam a chur air Westminster mun 'ghealltanas' a rinn iad a thaobh tuilleadh chumhachdan a thiomnadh do dh'Alba," thuirt e.
"Tha seo air Alba a chur ann an suidheachadh air leth làidir. "Bhruidhinn mi ris a' Phrìomhaire an-diugh agus, ged a rinn e ath-aithris air a mhiann gus leantainn air mar a mhìnich e, cha toireadh e gealltanas a thaobh bhòt dara leughaidh (ann an Taigh nan Cumantan) ron 27 Màrt air Bile na h-Alba. "Chaidh sin a ghealltainn gu soilleir le Gòrdan Brown tron iomairt. "Tha am prìomhaire air a ràdh gum biodh an leithid de bhòt gun bhrìgh. Tha mi an amharas nach urrainn dha barantas a thoirt air taic a phàrtaidh." Image caption Chuir Glaschu, an sgìre Chomhairle as motha an Alba agus an treas mòr-bhaile as motha ann am Breatainn, taic ri neo-eisimeileachd. Tha mòran luchd-poileataigs air moladh a dhèanamh air na chuir am Prìomh Mhinistear ris an deasbad phoileataigeach, nam measg Daibhidh Camshron, a thug iomradh air "fìor thàlant agus faireachdainn" Mhgr Salmond. Air oidhche an referendum, bhòt 28 a-mach à 32 ùghdarras ionadail airson fuireach taobh a-staigh na RA. Chuir Glaschu, an sgìre Chomhairle as motha an Alba agus an treas mòr-bhaile as motha ann am Breatainn, taic ri neo-eisimeileachd 194,779 an aghaidh 169,347. Ach, aig 75%, b' ann an Glaschu a thionndaidh an ìre a bu lugha a-mach airson bhòtadh. Ged a bha dòchas am measg luchd-iomairt Bu Chòir, cha deach bhòtadh taic a chur ri neo-eisimeileachd ann an àiteachan sam b' àbhaist na Làbaraich a bhith làidir, leithid Siorrachd Lannraig a Deas, Inbhir Chluaidh agus Siorrachd Àir air fad. Image caption Air oidhche an referendum, bhòt 28 a-mach à 32 ùghdarras ionadail airson fuireach taobh a-staigh na RA. Chaidh neo-eisimeileachd a dhiùltadh gu làidir ann an Dùn Èideann, le 194,638 bhòtaichean an aghaidh 123,927, fhad 's a bhòt 20,000 a bharrachd airson "Cha Bu Chòir" ann am Baile Obar Dheathain. Thairis air Alba air fad, bhòt 84.6% de na bha clàraichte anns an referendum - an cunntas a bu mhotha riamh ann an taghadh nàiseanta. Thuirt Mgr Camshron gun deadh gealltanas phàrtaidhean Westminster a "bhuileachadh gu h-iomlan" an dèidh do bhuil na bhòta a bhith air fhoillseachadh. Thuirt e gur e am Morair Mac a' Ghobhainn Khelvin a dheadh os cionn na pròiseas gus gealltanasan, le cumhachdan ùra a thaobh chìsean, ionmhais agus shochairean a dheadh aontachadh ron t-Sultain, agus dreach de bhun-reachd a dheadh fhoillseachadh san Fhaoilleach. Bhruidhinn am Prìomhaire cuideachd air a' bhuaidh a bhiodh aig an seo air a' chòrr den RA, ag ràdh "gum feumadh na milleanan de ghuthan Sasannach èisteachd fhaighinn cuideachd". Thuirt e: "A' cheist a thaobh bhòtaichean Sasannach airson laghan Sasannach, ceist Lodainn an Iar mar a th' aca orra, tha feum air freagairt deireannach dhi agus, mar sin, dìreach mar a bhòtas Alba fa leth ann am Pàrlamaid na h-Alba air an cuid ghnothaichean a thaobh chìsean, ionmhais agus shochairean, bu chòir gum bi cothrom aig Sasainn a thuilleadh air a Chuimrigh agus Èirinn a Tuath bhòtadh mu na cùisean sin cuideachd."